استفاده از فاضلاب شهری تصفیه شده به عنوان یک منبع آب جایگزین، در اقصی نقاط دنیا افزایش یافته و شواهد نشانگر روند روز افزون استفاده از این منبع آب غیرمتعارف در کشورهای توسعه یافته و در حال توسعه است. قیمت‌گذاری مناسب بر پساب، یکی از مهم‌ترین ابزارهای موثر در مصرف بهینه این منبع آبی است. در این پژوهش با استفاده از مدل شبکه عصبی، عوامل موثر بر قیمت پساب تولیدی در محدوده اصفهان بررسی شد.عوامل موثر بر تعرفه پساب بسیار متنوع است. در این پژوهش اثر عواملی چون جمعیت تحت پوشش تاسیسات تصفیه فاضلاب، حجم پساب تولیدی در تصفیه‌خانه‌های فاضلاب، هزینه‌های بازسازی و نگهداری تصفیه‌خانه‌های در حال بهره‌برداری، تراز ارتفاعی، مصارف مختلف آب در منطقه، کارمزد خدمات دفع فاضلاب صنعتی، هزینه تمام شده هر متر اجرا و اتصال لوله و حجم منابع آب تولیدی توسط قنوات و چشمه‌های منطقه بر قیمت پساب مورد بررسی قرار گرفت. مدل‌سازی شبکه عصبی به‌عنوان ابزاری برای شناسایی اهمیت این عوامل بر قیمت پساب به‌کار گرفته شد. باتوجه به داده‌های موجود و مدل‌های شبکه عصبی، اثر انواع معماری‌ها و ساختارها با تعداد لایه‌های میانی متفاوت و تعداد متفاوت گره‌های هر لایه بر داده‌های قیمت پساب، بررسی شد و مدل شبکه عصبی نهایی انتخاب شده است.نتایج نشان می‌دهد که شبکه عصبی از قدرت بالایی برخوردار است و به‌خوبی توانسته است اهمیت پارامترهای مختلف در قیمت‌گذاری پساب را تعیین کند. بر اساس نتایج این پژوهش عواملی چون هزینه تمام شده هر متر اجرا و اتصال لوله انتقال، مصرف آب در بخش صنعت و هزینه‌های بازسازی و نگهداری تصفیه‌خانه‌های در حال بهره برداری دارای بیشترین اهمیت در شاخص قیمت پساب است. 3Director, Budget and Water Planning office, Isfahan Regional Water Co. The evidence indicates increasing trend of use of municipal wastewater treatment effluent as an alternative source of water both in developed and developing countries. Proper pricing of this unconventional water is one of the most effective economic tools to encourage optimum use of fresh water resources. In this study, artificial neural network is employed to identify and assess the factors affecting effluent tariffs supplied to local industries in Isfahan region. Given the wide variety of factors involved in the ultimate value of wastewater traement plant effluent, an assortment of relevant factors has been considered in this study; the factors include the population served by the treatment plant, volume of effluent produced, maintenance, repair and replacement. costs of operating plants, topography, different water uses in the region, industrial wastewater collection fees, unit cost of pipe and fittings, and the volumes of water supplied from springs and aqueducts in the region. Neural network modeling is used as a tool to determine the significance of each factor for pricing effluent. Based on the available data and the neural network models, the effects of different model architectures with different intermediate layers and numbers of nodes in each layer on the price of wastewater were investigated to develop aand adopt a final neural network model. Results indicate that the proposed neural network model enjoys a high potential and has been well capable of determining the weights of the parameter affecting in pricing effluent. Based on the the results of this study, the factors with the greatest role in effluent pricing are unit cost of pipe and fittings, industrial use of water, and the costs of plant maintentance, repair and replacement. Lassevits, J. F., and Berrua, D. (2001). “Study of phophorus-Propertion of Phosphorus from detergents in continental waters.” Geuplus Pers Comm, 350P. Edge, D. (1999). “Perspectives for nutrient removal from sewage and implications for sludge strategy.” Environ. Technol., 20, 759-763. Picton, P. (2002). Neural Networks: Principles and functional, translations doctor Mehdi Ghazanfari and Jamal Orkut, Publisher Iran University of Science and Technology, Tehran. Nowak, O., Franz, A., Svardal, K., and Müller, V. (1996). “Specific organic and nutrient loads in stabilised sludge from municipal treatment plants.” Water Sci. and Technol., 33, 243-250. Kashfi, H. (2012). “Private sector investment in wastewater treatment facilities for waste water allocation in the form of buyback contract.” 9th International Management Conference, Tehran, Iran. Abdolghafoorian, A., Tajrishy, M., and Abrishamchi, A. (2013). “Urban water management and wastewater runoff as new sources of water.” Water and Sanitation, 4, 29-42. Mohammadnegad, S., and Tajrishy, M. (1997). “Technical and economic evaluation of Tehran's wastwater treatment effluent for landscape irrigation.” Proceedings of the 2nd International Civil Engineering Conference, Sharif University of Technology, Iran. Salvitabar, A., Zarghami, A. M., and Abrishamchi, A. (2006). 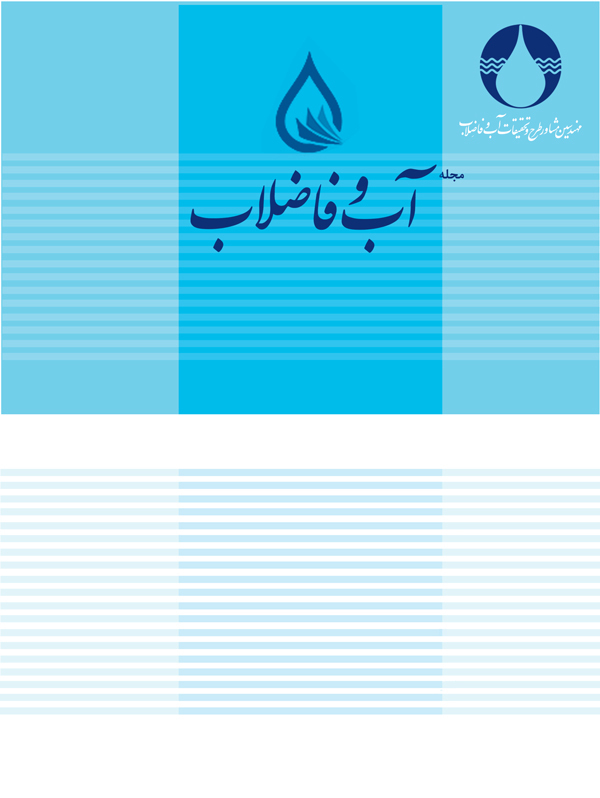 “System dynamics model in urban water management in Tehran.” Water and Sanitation, Vol. 17, No. 3 (59), 12-28. Najafi, M. and Bibalani, B. (2011). “Removable water requirement agricultural land resource allocation Tehran from urban waste water treatment plants, recycled water and wastewater.” Second place in the National Seminar on Water Resources Management, the first regional Conference on civil Engineering, Azad University of Khomeinishahr. Nowak, O. (2000). “Expenditure on the operation of municipal wastewater treatment plants for nutrient removal.” Water Sci. and Technol., 41, 281-289. Samadi, S., and Nazifi, M. (2014). “Analysis of factors affecting fluctuations in the price of gold using a Markov switching, Journal: Monetary Economics, Finance.” Scientific Research, 26, 121-146.